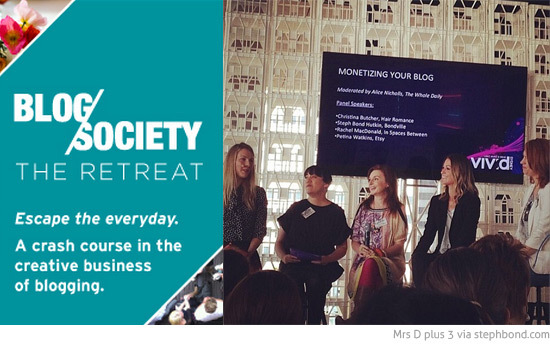 Last weekend I spoke on a panel at the Blog Society event "The Retreat: A Crash Course In The Creative Business Of Blogging" at Vivid Sydney. Want to see a pic? Thansk Mrs D plus 3 for the great pic! It was an amazing morning with a fantastic selection of speakers and panelists. I'm chatting above with moderator Alice Nicholls from The Whole Daily, and panelists Petina Watkins from Etsy, Rachel MacDonald from In Spaces Between and Christina from Hair Romance. We all approach our work in different ways but had a common theme of working from the heart, and being passionate about what we do. I also really meeting attendees and chatting after the event - so many interesting people doing interesting things. Vivid Sydney runs through until the 9th June 2014. Get all the info on the lights, ideas and music right here.